Finally, The Adjustable Standing Desk Converter You've Been Looking For! 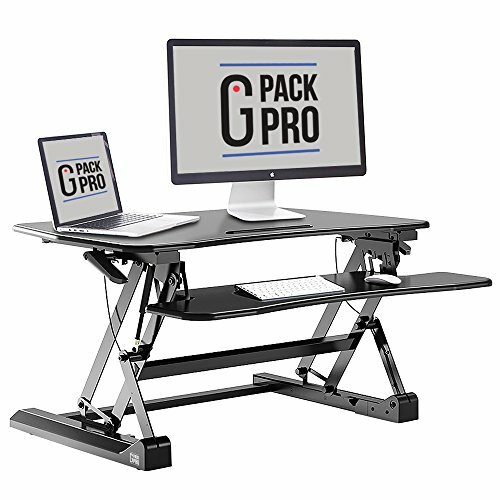 Unlike other desk converters that limit your options, the Adjustable Desk Converter by G-PACK PRO gives you as many options as you need! Enjoy a more comfortable working position while increasing your productivity. Our standup desk converter is EASY to adjust, giving you a multitude of height options in a matter of seconds. Stable and smooth, we've improved the spring hovering mechanism so that you never have to worry about it breaking (or bumping off your work equipment). Designed with a large 35" work space, our convertible computer desk gives you the space you need to accommodate dual screens and any other tools you need to get your work done seamlessly. - You can stop the sit-to-stand desk riser AT ANY POINT, from 5.7" to 19.7", to find the perfect height. - You can adjust your desk stand riser with only a light squeeze of the handles. - You don't have to take up extra room on your desk thanks to the straight up and down movement contained to its own footprint. - Ours is made from super high-quality materials, including a heavy duty metal from and a sturdy triple leg base. - You can remove the keyboard tray as you need to give you more room for bigger projects and a cleaner workspace. - Easily fit everything you need on your stand-up desk riser, from two monitors to your cup of coffee. Easy to assemble and use, our stand desk converter is the smart, ergonomic solution you've been looking for. Use at home and at your office! Feel free to sit or stand. Feel awesome while you work. Improve your work posture today and click "Add to Cart" now! CONVERT YOUR DESK TO A STANDING DESK: The easy and effective way to make working more comfortable, the G-PACK PRO stand-up desk converter is sturdy and simple to install. Enjoy a more ergonomic position while you work at your computer! FULLY ADJUSTABLE DESK CONVERTER: Enjoy adjusting your your sit-stand desk converter to any height that's right for you. More options than other standing desk converter products, it rises to an impressive 19.7" as needed! LARGE STANDING DESK CONVERTER FITS DUAL MONITORS: Don't take up space with your desk converter - make more! Our laptop desk converter is 35" wide and rise and folds vertically so that your desk stays organized and uncluttered. SUPER DURABLE MATERIALS LAST LONGER: The G-Pack Pro Desktop Standing Desk Converter features a resilient spring hovering mechanism that allows for smooth adjustment in a matter of seconds. Just squeeze the handles to easily move up or down. If you have any questions about this product by G-Pack Pro, contact us by completing and submitting the form below. If you are looking for a specif part number, please include it with your message.